As the world turns closer towards another economic collapse, banking powers are developing methods for dealing with the inevitable fall out. Bail-ins are one such development that the EU plans to employ in the new year. Within the rules outlined, being mirrored in other areas, a bank can effectively steal funds from its depositors, under certain conditions. But the rhetoric surrounding bail-ins is far more deceptive. Banks are actually claiming that bail-ins will protect taxpayers from having to bail-out 'too big to fail' banks, but in reality, these rules just cut out the government as the middleman. To be sure, the bank would actually fail, and of course the value of currency would still be affected, so in the end it doesn't seem to provide all that much protection. Here's how it works. When a bank beings to have solvency issues, the first in line to give up their holdings would be creditors, the bank itself. Next in line would be share and bondholders, and finally unsecured depositors with more than €100,000 in their accounts would be last. According to the rules, any depositor with less than €100,000 is exempt from the bail-in, but as the below article details, these rules are hardly set in stone. This year, Greece saw a major liquidity problem, and as a result, it limited withdrawals for all depositors. If someone can't access the funds in their account, it is effectively the same as it being stolen from them because they cannot access it. And when we lose the right use a thing, it means we've lost ownership of it, even if later on they do allow full access to the funds in an account. 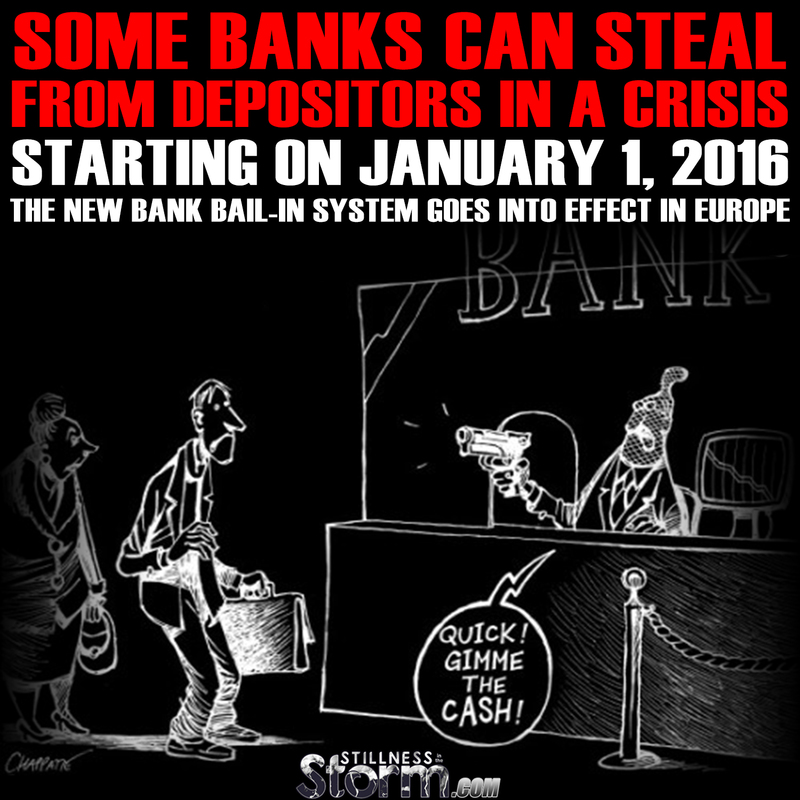 So while banks speak of these changes as a platform to protect the people, in reality, they make it legal for the bank to steal from its shareholders and depositors in an effort to save the bank. And if it ever got to the point where a bank needed get bailed-in, the economic fallout would most likely already be catastrophic. All of this suggest what many have already come to know, that banks have almost completely lost all confidence, and as such, are resorting to legal piracy to maintain themselves. In earlier times, the mere mention of a bank's loss of solvency was enough to cause a run on the bank. J.P. Morgan in the run up to the creation of the Federal Reserve system spread many rumors about smaller banks insolvency, so he could later buy them up at pennies on the dollar. But today, the people are so completely out of touch with reality, they can't see the forest for the trees. Despite all this, there is always hope, in that we can develop our own monetary systems free of debt and deceptive manipulation. In fact, the most successful economies on Earth have used monetary systems run by and for the people. See the below-linked article for more on this.